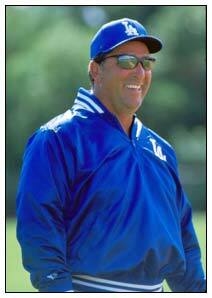 Jack Clark: "I'm not a Dodger"
When he coached the Dodgers, Jack Clark always wore a jacket. He was the only one on the team who never took his off, because it covered his name and his number 22 on the back of his Los Angeles jersey. "Hey Jack, it's sure hot out here, isn't it?" a fellow coach taunted him one blazing afternoon. "Yes it is," answered Clark. "But I'm not letting anybody see Jack Clark wear a Dodger uniform." Clark coached Dodgers hitters for two-and-a-half years, garnering high praise from his players even when Los Angeles floundered offensively. But the longtime Giants slugger was never comfortable in Dodger blue. "I'm not a Dodger and I felt really weird wearing that uniform," said Clark. "I didn't like it because I'm loyal that way, but when I called, I was turned down by the Giants and the Cardinals. The only ones that really offered me anything were the Dodgers." Clark struggled to recover from serious injuries he sustained in a motorcycle accident that nearly claimed his life before the Dodgers fired him in 2003. He also coached and managed two minor league teams in Missouri and Texas in 2004, though he wants to return to the majors. "I think I'm the best hitting coach in baseball and not in the big leagues," he said.